Really lovely, the room was very clean and modern. The hotel was in a great location, we just went everywhere by foot. LOVED staying here! The staff were all excellent. Loved the night guy. I loved that the location was on the Prinsengracht canal. The view was lovely. It was relatively quiet. If you want to be in the thick of the action, stay elsewhere. But everything was quite walk-able and I loved that it was relatively peaceful and felt safe. Sitting in the window drinking coffee was fun. The room was comfortable, clean, and nice. Laundry facilities would be appreciated. Breakfast is over-rated. 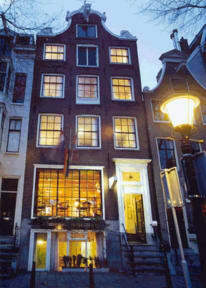 Great location in terms of proximity to the red light district and to Centraal station. 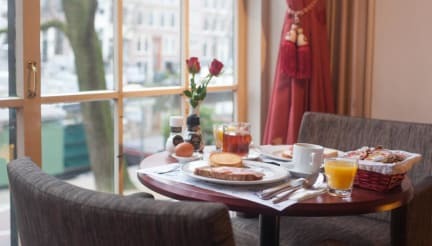 A little loud with a canal nearby, but the staff were very kind and the rooms were clean, along with the community amenities. Highly recommend. Very good stay. The location was good ,a little far from many of the famous sites, otherwise very good if you want to experience Paris everyday life. Nice location and staff. highly recommend. Nice room with clean bathrooms. Close enough to bike all over Amsterdam, most places 10 min or less away. It was great to be close to everything, but not in the thick of it. The room wasn't cleaned for the duration of our stay, the floorboards were warped and the walls grimy. The facilities were poor but the location was great. If you can put up with the rooms, it's a good choice.